In Chapter 1, we were introduced to history teacher Chris Hawkins. The family Mr. Hawkins grew up in was far from poor: his father was a colonel in the U.S. Air Force, and his mother was a store manager. He had no clue what growing up in poverty was like, and he was shocked to learn about what typically goes on (and doesn't go on) in the homes of his kids. He has learned that there's far more behind the apathetic or aggressive behaviors, commonly attributed to a lack of politeness or dismissed as "lower-class” issues, than he had assumed. What he's learned about his students has depressed and discouraged him. The mantra that gets him through the year is the thought that retirement is only six years away. There is no shortage of theories explaining behavior differences among children. The prevailing theory among psychologists and child development specialists is that behavior stems from a combination of genes and environment. Genes begin the process: behavioral geneticists commonly claim that DNA accounts for 30–50 percent of our behaviors (Saudino, 2005), an estimate that leaves 50–70 percent explained by environment. This tidy division of influencing factors may be somewhat misleading, however. First, the effects of the nine months a child spends in utero are far from negligible, especially on IQ (Devlin, Daniels, & Roeder, 1997). Factors such as quality of prenatal care, exposure to toxins, and stress have a strong influence on the developing child. In addition, the relatively new field of epigenetics—the study of heritable changes in gene function that occur without a change in primary DNA sequence—blurs the line between nature and nurture. Environment affects the receptors on our cells, which send messages to genes, which turn various functional switches on or off. It's like this: like light switches, genes can be turned on or off. When they're switched on, they send signals that can affect the processes or structures in individual cells. For example, lifting weights tells the genes to "turn on” the signal to build muscle tissue. Genes can be either activated or shut off by a host of other environmental factors, such as stress and nutrition. These switches can either strengthen or impair aggression, immune function, learning, and memory (Rutter, Moffitt, & Caspi, 2006). Recent evidence (Harris, 2006) suggests that the complex web of social relationships students experience—with peers, adults in the school, and family members—exerts a much greater influence on their behavior than researchers had previously assumed. This process starts with students' core relationships with parents or primary caregivers in their lives, which form a personality that is either secure and attached or insecure and unattached. Securely attached children typically behave better in school (Blair et al., 2008). Once students are in school, the dual factors of socialization and social status contribute significantly to behavior. The school socialization process typically pressures students to be like their peers or risk social rejection, whereas the quest for high social status drives students to attempt to differentiate themselves in some areas—sports, personal style, sense of humor, or street skills, for example. Combined, these factors present an extraordinary challenge to academic and social success. This reality does not mean that success in school or life is impossible. On the contrary, a better understanding of these challenges points to actions educators can take to help their less-advantaged students succeed. Many low-SES children face emotional and social instability. Typically, the weak or anxious attachments formed by infants in poverty become the basis for full-blown insecurity during the early childhood years. Very young children require healthy learning and exploration for optimal brain development. Unfortunately, in impoverished families there tends to be a higher prevalence of such adverse factors as teen motherhood, depression, and inadequate health care, all of which lead to decreased sensitivity toward the infant (van Ijzendoorn et al., 2004) and, later, poor school performance and behavior on the child's part. A strong, reliable primary caregiver who provides consistent and unconditional love, guidance, and support. Ten to 20 hours each week of harmonious, reciprocal interactions. This process, known as attunement, is most crucial during the first 6–24 months of infants' lives and helps them develop a wider range of healthy emotions, including gratitude, forgiveness, and empathy. Enrichment through personalized, increasingly complex activities. Children raised in poverty are much less likely to have these crucial needs met than their more affluent peers are and, as a result, are subject to some grave consequences. Deficits in these areas inhibit the production of new brain cells, alter the path of maturation, and rework the healthy neural circuitry in children's brains, thereby undermining emotional and social development and predisposing them to emotional dysfunction (Gunnar, Frenn, Wewerka, & Van Ryzin, 2009; Miller, Seifer, Stroud, Sheinkopf, & Dickstein, 2006). The need for human contact and warmth is well established. A study of infants in Irish foundling homes in the early 1900s found that of the 10,272 infants admitted to homes with minimal or absent maternal nurturing over a 25-year period, only 45 survived. Most of the survivors grew into pathologically unstable and socially problem-ridden adults (Joseph, 1999). In many poor households, parental education is substandard, time is short, and warm emotions are at a premium—all factors that put the attunement process at risk (Feldman & Eidelman, 2009; Kearney, 1997; Segawa, 2008). Caregivers tend to be overworked, overstressed, and authoritarian with children, using the same harsh disciplinary strategies used by their own parents. They often lack warmth and sensitivity (Evans, 2004) and fail to form solid, healthy relationships with their children (Ahnert, Pinquart, & Lamb, 2006). In addition, low-income caregivers are typically half as likely as higher-income parents are to be able to track down where their children are in the neighborhood (Evans, 2004), and frequently they do not know the names of their children's teachers or friends. One study found that only 36 percent of low-income parents were involved in three or more school activities on a regular basis, compared with 59 percent of parents above the poverty line (U.S. Department of Health and Human Services, 2000). Low-SES children are often left home to fend for themselves and their younger siblings while their caregivers work long hours; compared with their well-off peers, they spend less time playing outdoors and more time watching television and are less likely to participate in after-school activities (U.S. Census Bureau, 2000). Unfortunately, children won't get the model for how to develop proper emotions or respond appropriately to others from watching cartoons; they need warm, person-to-person interactions. The failure to form positive relationships with peers inflicts long-term socioemotional consequences (Szewczyk-Sokolowski et al., 2005). The human brain "downloads” the environment indiscriminately in an attempt to understand and absorb the surrounding world, whether that world is positive or negative. When children gain a sense of mastery of their environments, they are more likely to develop feelings of self-worth, confidence, and independence, which play heavily into the formation of children's personalities (Sroufe, 2005) and ultimately predict their success and happiness in relationships and in life in general. Economic hardship makes it more difficult for caregivers to create the trusting environments that build children's secure attachments. Behavior research shows that children from impoverished homes develop psychiatric disturbances and maladaptive social functioning at a greater rate than their affluent counterparts do (McCoy, Firck, Loney, & Ellis, 1999). In addition, low-SES children are more likely to have social conduct problems, as rated by both teachers and peers over a period of four years (Dodge, Pettit, & Bates, 1994). Unfortunately, a study of negative emotionality and maternal support found that low-income parents were less able than were well-off parents to adjust their parenting to the demands of higher-needs children (Paulussen-Hoogeboom, Stams, Hermanns, & Peetsma, 2007). Low-income parents are often overwhelmed by diminished self-esteem, depression, and a sense of powerlessness and inability to cope—feelings that may get passed along to their children in the form of insufficient nurturing, negativity, and a general failure to focus on children's needs. In a study of emotional problems of children of single mothers, Keegan-Eamon and Zuehl (2001) found that the stress of poverty increases depression rates among mothers, which results in an increased use of physical punishment. Children themselves are also susceptible to depression: research shows that poverty is a major predictor of teenage depression (Denny, Clark, Fleming, & Wall, 2004). Strong, secure relationships help stabilize children's behavior and provide the core guidance needed to build lifelong social skills. Children who grow up with such relationships learn healthy, appropriate emotional responses to everyday situations. But children raised in poor households often fail to learn these responses, to the detriment of their school performance. For example, students with emotional dysregulation may get so easily frustrated that they give up on a task when success was just moments away. And social dysfunction may inhibit students' ability to work well in cooperative groups, quite possibly leading to their exclusion by group members who believe they aren't "doing their part” or "pulling their share of the load.” This exclusion and the accompanying decrease in collaboration and exchange of information exacerbate at-risk students' already shaky academic performance and behavior. Some teachers may interpret students' emotional and social deficits as a lack of respect or manners, but it is more accurate and helpful to understand that the students come to school with a narrower range of appropriate emotional responses than we expect. The truth is that many children simply don't have the repertoire of necessary responses. It is as though their brains' "emotional keyboards” play only a few notes (see Figure 2.1). Gaps in politeness and social graces. A more limited range of behavioral responses. Less empathy for others' misfortunes. These behaviors will likely puzzle, frustrate, or irritate teachers who have less experience teaching students raised in poverty, but it's important to avoid labeling, demeaning, or blaming students. It is much easier to condemn a student's behavior and demand that he or she change it than it is to help the student change it. Every proper response that you don't see at your school is one that you need to be teaching. Rather than telling kids to "be respectful,” demonstrate appropriate emotional responses and the circumstances in which to use them, and allow students to practice applying them. To shift your own responses to inappropriate behavior, reframe your thinking: expect students to be impulsive, to blurt inappropriate language, and to act "disrespectful” until you teach them stronger social and emotional skills and until the social conditions at your school make it attractive not to do those things. It's impossible to overemphasize this: every emotional response other than the six hardwired emotions of joy, anger, surprise, disgust, sadness, and fear must be taught. Cooperation, patience, embarrassment, empathy, gratitude, and forgiveness are crucial to a smoothly running complex social environment (like a classroom). When students lack these learned responses, teachers who expect humility or penitence may get a smirk instead, a response that may lead teachers to believe the student has an "attitude.” It's the primary caregiver's job to teach the child when and how to display these emotional responses, but when students do not bring these necessary behaviors to school, the school must teach them. The drive for reliable relationships. Students want the safety of a primary safe and reliable relationship. Students would prefer parents, positive friends, and teachers, but they'd take an "iffy” friend if no one else were available. The relationships that teachers build with students form the single strongest access to student goals, socialization, motivation, and academic performance. For your school to foster high achievement, every student will need a reliable partner or mentor. The strengthening of peer socialization. Socialization is the drive for acceptance that encourages students to imitate their peers and join groups, from clubs to cliques to gangs. Students want to belong somewhere. Evidence suggests that it is peers, not parents, who have the greatest influence on school-age students (Harris, 1998). If your school aims to improve student achievement, academic success must be culturally acceptable among your students. The quest for importance and social status. This is the quest to feel special. Students compete for attention and social elevation by choosing roles that will distinguish them (e.g., athlete, comedian, storyteller, gang leader, scholar, or style maverick). Kids are very interested in what other kids do, whether others like them, and how they rate on the social scale (Harris, 2006). Every student will need to feel like the "status hunt” can just as well lead to better grades as better behaviors. Each of these forces shapes behaviors in significant ways. Schools that succeed use a combination of formal and informal strategies to influence these three domains. Informally, teachers can incorporate classroom strategies that build relationships and strengthen peer acceptance and social skills in class. This is a fair warning to all administrators: do not dismiss the so-called "soft side” of students' lives, the social side. It runs their brains, their feelings, and their behaviors—and those three run cognition! There is a complex interplay between cognition and emotions. When students feel socialized and accepted, they perform better academically. However, pushing students harder and harder into performing well academically may conflict with social/relational success. You will hit a test score ceiling until you include students' emotional and social lives in your school "makeover.” Accordingly, throughout the remainder of this book, I offer specific strategies that address all three of the relational forces. Give respect to students first, even when they seem least to deserve it. Share the decision making in class. For example, ask students whether they would prefer to do a quick review of what they have learned to consolidate and strengthen their learning or move on to new material. Avoid such directives as "Do this right now!” Instead, maintain expectations while offering choice and soliciting input (e.g., "Would you rather do your rough draft now or gather some more ideas first?”). Avoid demeaning sarcasm (e.g., "How about you actually do your assignment quietly for a change?”). Model the process of adult thinking. For example, say, "We have to get this done first because we have only enough time for these three things today.” Keep your voice calm and avoid labeling actions. Teach basic but crucial meet-and-greet skills. Early in the year, when students introduce themselves to other classmates, teach students to face one another, make eye contact, smile, and shake hands. Embed turn-taking skills in class, even at the secondary level. You can introduce and embed these skills using such strategies as learning stations, partner work, and cooperative learning. Remind students to thank their classmates after completing collaborative activities. Implement social-emotional skill-building programs in the early years. Programs like the PATHS program, Conscious Discipline, and Love and Logic embed social skills into a classroom management framework. Always refer to the school as "our school” and the class as "our class”; avoid using a me-and-you model that reinforces power structures. Acknowledge students who make it to class, and thank them for small things. Celebrate effort as well as achievement; praise students for reaching milestones as well as for fulfilling end goals. Pack acknowledgments and celebrations into every single class. Stress can be defined as the physiological response to the perception of loss of control resulting from an adverse situation or person. Occasional or "roller-coaster” stress is healthy for all of us; it supports our immune function and helps develop resiliency. However, the acute and chronic stress that children raised in poverty experience leaves a devastating imprint on their lives. Acute stress refers to severe stress resulting from exposure to such trauma as abuse or violence, whereas chronic stress refers to high stress sustained over time. Low-SES children are more subject to both of these types of stress than are their more affluent peers, but chronic stress is more common and exerts a more relentless influence on children's day-today lives. Children living in poverty experience significantly greater chronic stress than do their more affluent counterparts (Almeida, Neupert, Banks, & Serido, 2005) (see Figure 2.2). This kind of stress exerts a devastating, insidious influence on children's physical, psychological, emotional, and cognitive functioning—areas that affect brain development, academic success, and social competence. Students subjected to such stress may lack crucial coping skills and experience significant behavioral and academic problems in school. Source: Adapted from "Cumulative Risk, Maternal Responsiveness, and Allostatic Load Among Young Adolescents,” by G. W. Evans, P. Kim, A. H. Ting, H. B. Tesher, and D. Shannis, 2007, Developmental Psychology, 43(2), pp. 341–351. The biology of stress is simple in some ways and complex in others. On a basic level, every one of the 30–50 trillion cells in your body is experiencing either healthy or unhealthy growth. Cells cannot grow and deteriorate at the same time. Ideally, the body is in homeostatic balance: a state in which the vital measures of human function—heart rate, blood pressure, blood sugar, and so on—are in their optimal ranges. A stressor is anything that threatens to disrupt homeostasis—for example, criticism, neglect, social exclusion, lack of enrichment, malnutrition, drug use, exposure to toxins, abuse, or trauma. When cells aren't growing, they're in a "hunker down” mode that conserves resources for a threatened future. When billions or trillions of cells are under siege in this manner, you get problems. Although the body is well adapted to deal with short-term threats to homeostasis, chronic or acute stressors challenge the body differently. Among low-income families, stressors may include living in overcrowded, substandard housing or unsafe neighborhoods; enduring community or domestic violence, separation or divorce, or the loss of family members; and experiencing financial strain, forced mobility, or material deprivation (Evans & English, 2002). The frequency and intensity of both stressful life events and daily hassles are greater among low-SES children (Attar, Guerra, & Tolan, 1994). For example, in any given year, more than half of all poor children deal with evictions, utility disconnections, overcrowding, or lack of a stove or refrigerator, compared with only 13 percent of well-off children (Lichter, 1997). In addition, such factors as lack of proper supervision, physical neglect or abuse, inadequate day care and schools, difficulties in forming healthy friendships, and vulnerability to depression combine to exert inordinate and debilitating stress upon the developing child. More often than not, low-income parents are overstressed in trying to meet the daily needs of their families. The resulting depression and negativity often lead to insufficient nurturing, disengaged parenting, and a difficulty in focusing on the needs of children. Compared with middle-income children, low-SES children are exposed to higher levels of familial violence, disruption, and separation (Emery & Laumann-Billings, 1998). Lower levels of parental education and occupation also correlate with greater incidence of neighborhood crimes (Sampson, Raudenbush, & Earls, 1997). And compared with their well-off peers, 2- to 4-year-olds from low-income families interact with aggressive peers 40 percent more often in their neighborhoods and 25 percent more often in child care settings (Sinclair, Pettit, Harrist, Dodge, & Bates, 1994). Abuse is a major stressor to children raised in poverty. Numerous studies (Gershoff, 2002; Slack, Holl, McDaniel, Yoo, & Bolger, 2004) document that caregivers' disciplinary strategies grow harsher as income decreases. Lower-income parents are, on average, more authoritarian with their children, tending to issue harsh demands and inflict physical punishment such as spanking (Bradley, Corwyn, Burchinal, McAdoo, & Coll, 2001; Bradley, Corwyn, McAdoo, & Coll, 2001). One study found that blue-collar parents were twice as likely to use physical punishment with their 7-year-olds as white-collar parents were (Evans, 2004). Hussey, Chang, and Kotch (2006) found that poor children were 1.52 times more likely to report physical neglect and 1.83 times more likely to report sexual abuse than were well-off children. Abuse occurs with much higher frequency when the parents use alcohol or drugs, experience an array of stressful life events (Emery & Laumann-Billings, 1998), or live in decrepit, crime-ridden neighborhoods with limited social support networks (Jack & Jordan, 1999). The cost of these constant stressors is hard to quantify. Exposure to chronic or acute stress is hardwired into children's developing brains, creating a devastating, cumulative effect (Coplan et al., 1996). Compared with a healthy neuron, a stressed neuron generates a weaker signal, handles less blood flow, processes less oxygen, and extends fewer connective branches to nearby cells. The prefrontal cortex and the hippocampus, crucial for learning, cognition, and working memory, are the areas of the brain most affected by cortisol, the so-called "stress hormone.” Experiments have demonstrated that exposure to chronic or acute stress actually shrinks neurons in the brain's frontal lobes—an area that includes the prefrontal cortex and is responsible for such functions as making judgments, planning, and regulating impulsivity (Cook & Wellman, 2004)—and can modify and impair the hippocampus in ways that reduce learning capacity (Vythilingam et al., 2002). Unpredictable stressors severely impair the brain's capacity to learn and remember (Yang et al., 2003). Child abuse, for example, is highly disruptive to such developmental processes as the formation of healthy attachments, emotional regulation, and temperament formation, and leads to a wide array of social-emotional and psychological disturbances in adulthood (Emery & Laumann-Billings, 1998). Neurobiological studies have shown considerable alterations in the brain development of neglected or abused children. The production of "fight-or-flight” stress hormones in these children atrophies the areas that control emotional regulation, empathy, social functioning, and other skills imperative to healthy emotional development (Joseph, 1999). Chronic stress not only diminishes the complexity of neurons in the frontal lobe and the hippocampus but also increases the complexity of neurons in the amygdala, the brain's emotion center (Conrad, 2006). This increased complexity may make the stressed brain's neurons far more sensitive to memory modulation than neurons in nonstressed brains. In chronically stressed kids, the combined effects on the hippocampus and the amygdala may be precisely what facilitates emotional memory (the aspect of memory that encompasses highly salient memories of events such as divorce, abuse, trauma, death, or abandonment) and reduces declarative memory (the aspect of memory that stores standard knowledge and learning). Chronic, unmediated stress often results in a condition known as an allostatic load. Allostatic load is "carryover” stress. Instead of returning to a healthy baseline of homeostasis, the growing brain adapts to negative life experiences so that it becomes either hyper-responsive or hypo-responsive. Szanton, Gill, and Allen (2005) found higher rates of chronic stress and allostatic load among low-income populations than among high-income populations. Is linked to over 50 percent of all absences (Johnston-Brooks, Lewis, Evans, & Whalen, 1998). Impairs attention and concentration (Erickson, Drevets, & Schulkin, 2003). Reduces cognition, creativity, and memory (Lupien, King, Meaney, & McEwen, 2001). Diminishes social skills and social judgment (Wommack & Delville, 2004). Reduces motivation, determination, and effort (Johnson, 1981). Increases the likelihood of depression (Hammack, Robinson, Crawford, & Li, 2004). Reduces neurogenesis (growth of new brain cells) (De Bellis et al., 2001). A child who comes from a stressful home environment tends to channel that stress into disruptive behavior at school and be less able to develop a healthy social and academic life (Bradley & Corwyn, 2002). Impulsivity, for example, is a common disruptive classroom behavior among low-SES students. But it's actually an exaggerated response to stress that serves as a survival mechanism: in conditions of poverty, those most likely to survive are those who have an exaggerated stress response. Each risk factor in a student's life increases impulsivity and diminishes his or her capacity to defer gratification (see Figure 2.3) (Evans, 2003). Source: Adapted from "A Multimethodological Analysis of Cumulative Risk and Allostatic Load Among Rural Children,” by G. W. Evans, 2003, Developmental Psychology, 39(5), pp. 924–933. Students raised in poverty are especially subject to stressors that undermine school behavior and performance. For example, girls exposed to abuse tend to experience mood swings in school, while boys experience impairments in curiosity, learning, and memory (Zuena et al., 2008). And the stress resulting from transience—frequent short-distance, poverty-related moves (Schafft, 2006)—also impairs students' ability to succeed in school and engage in positive social interactions. Whereas middle-class families usually move for social or economic improvement, the moves of low-income households are typically not voluntary. In addition to increasing children's uncertainty about the future, these moves compound their stress load by disrupting their social interactions both within the community and in academic environments (Schafft, 2006). Students who have to worry over safety concerns also tend to underperform academically (Pratt, Tallis, & Eysenck, 1997). Exposure to community violence—an unsafe home neighborhood or a dangerous path to school— contributes to lower academic performance (Schwartz & Gorman, 2003). In addition, stress resulting from bullying and school violence impairs test scores, diminishes attention spans, and increases absenteeism and tardiness (Hoffman, 1996). It is discouraging, but many high school students either stay home or skip classes due to fear of violence. Socioeconomic status correlates positively with good parenting, which, research has found, improves academic achievement (DeGarmo, Forgatch, & Martinez, 1999). Unfortunately, the converse is also true: the chronic stress of poverty impairs parenting skills, and disengaged or negative parenting in turn impairs children's school performance. Parents who are struggling just to stay afloat tend to work extra hours, odd shifts, or multiple jobs and are less able to provide attention and affection and to devote their time, energy, and resources to their children. These deficits have been associated with higher levels of externalizing behaviors and poor academic performance on children's part (Hsuch & Yoshikawa, 2007). Fishbein and colleagues (2006) found that adolescence, a period accompanied by dramatic brain changes, is a particularly vulnerable time for children to be exposed to chronic stress. They found that risky decision making (such as alcohol or drug use) and poor social competency correlated with adolescents' previous exposure to highly stressful life events. In addition, stress adversely affects cognition. One randomized, doubleblind, placebo-controlled study tested the effects of oral doses of cortisol (the stress chemical) on subjects (Newcomer et al., 1999). Cortisol treatment at the higher dose produced reversible decreases in verbal declarative memory in otherwise healthy individuals (Newcomer et al., 1999). Exposure to chronic or acute stress is debilitating. The most common adaptive behaviors include increased anxiety (as manifested in generalized anxiety disorders or posttraumatic stress disorder) and an increased sense of detachment and helplessness. Students from low-income families who experience disruptive or traumatic events or who lack a measure of connectedness—to family, to the community, or to a religious affiliation—demonstrate increased hopelessness over time (Bolland, Lian, & Formichella, 2005). Nearly half (47 percent) of low-SES African American adolescents reported clinically significant levels of depressive symptoms (Hammack et al., 2004). Low-SES students are more likely to give up or become passive and uninterested in school (Johnson, 1981). This giving-up process is known as learned helplessness. It's not genetic; it's an adaptive response to life conditions. And sadly, it frequently takes hold as early as 1st grade. Many kids with learned helplessness become fatalistic about their lives and are more likely to drop out of school or become pregnant while in their teens. It is well documented that the effect of stressors is cumulative (Astone, Misra, & Lynch, 2007; Evans, 2004; Evans & English, 2002; Evans, Kim, Ting, Tesher, & Shannis, 2007; Geronimus, Hicken, Keene, & Bound, 2006; Lucey, 2007). Children who have had greater exposure to abuse, neglect, danger, loss, or other poverty-related experiences are more reactive to stressors. Each stressor builds on and exacerbates other stressors and slowly changes the student. It is the cumulative effect of all the stressors that often makes life miserable for poor students. When researchers provided classes in appropriate coping skills and stress-relieving techniques, subjects demonstrated a decrease in hostility (Wadsworth, Raviv, Compas, & Connor-Smith, 2005) or depressive symptoms (Peden, Rayens, Hall, & Grant, 2005). Unfortunately, these interventions, along with stress-relieving recreational activities, are largely unavailable to those living in poverty. For example, neighborhood parks and recreational facilities tend to be scarcer, in hazardous areas, or in disrepair (Evans, 2004). Poor children are half as likely as well-off children are to be taken to museums, theaters, or the library, and they are less likely to go on vacations or on other fun or culturally enriching outings (Bradley & Corwyn, 2002). Believe that they have minimal control over stressors. Have no idea how long the stressors will last, or how intense they will remain. Have few outlets through which they can release the frustration caused by the stressors. Interpret stressors as evidence of circumstances worsening or becoming more hopeless. Lack social support for the duress caused by the stressors. Share with other staff members why it's so important to avoid criticizing student impulsivity and "me first” behaviors. Whenever you and your colleagues witness a behavior you consider inappropriate, ask yourselves whether the discipline process is positive and therefore increases the chances for better future behavior, or whether it's punitive and therefore reduces the chances for better future behavior. Reduce the parallels with prison. For example, consider eliminating bells and instead playing songs for class transitions. Reduce homework stress by incorporating time for homework in class or right after class. Use cooperative structures; avoid a top-down authoritarian approach. Help students blow off steam by incorporating celebrations, role-plays, and physical activities (e.g., walks, relays, or games) into your classes. Incorporate kinesthetic arts (e.g., drama or charades), creative projects (e.g., drawing or playing instruments), and hands-on activities (e.g., building or fixing) into your classes. Teaching students how to deal with anger and frustration (e.g., counting to 10 and taking slow, deep breaths). Introducing responsibilities and the value of giving restitution. In schools that embrace restitution, students understand that if they disrupt class, they need to "make it right” by doing something positive for the class. For example, a student who throws objects in the classroom may be assigned a cleaning or beautification project for the room. Teaching students to set goals to focus on what they want. Role-modeling how to solve real-world problems. Share an actual or hypothetical situation, such as your car running out of gas. You could explain that you tried to stretch the tank of gas too far and reveal how you dealt with the problem (e.g., calling a friend to bring some gas). Such examples show students how to take responsibility for and resolve the challenges they face in life. Giving students a weekly life problem to solve collectively. Teaching social skills. For example, before each social interaction (e.g., pair-share or buddy teaching), ask students to make eye contact, shake hands, and give a greeting. At the end of each interaction, have students thank their partners. Introducing stress reduction techniques, both physical (e.g., dance or yoga) and mental (e.g., guided periods of relaxation or meditation). Cognitive ability is highly complex. It can be measured in many different ways and is affected by numerous factors, not least of which is socioeconomic status. Socioeconomic status is strongly associated with a number of indices of children's cognitive ability, including IQ, achievement tests, grade retention rates, and literacy (Baydar, Brooks-Gunn, & Furstenberg, 1993; Brooks-Gunn, Guo, & Furstenberg, 1993; Liaw & Brooks-Gunn, 1994; Smith, Brooks-Gunn, & Klebanov, 1997). There is a gulf between poor and well-off children's performance on just about every measure of cognitive development, from the Bayley Infant Behavior Scales to standardized achievement tests. The correlations between socioeconomic status and cognitive ability and performance are typically quite significant (Gottfried, Gottfried, Bathurst, Guerin, & Parramore, 2003) and persist throughout the stages of development, from infancy through adolescence and into adulthood (see Figure 2.4). But these are data, not destiny. The good news is that brains are designed to change. Source: Adapted from "Environmental Risk Factors in Infancy,” by A. Sameroff, 1998, Pediatrics, 102(5), pp. 1287–1292. The prefrontal/executive system. This system, which engages the prefrontal cortex, includes our capacity to defer gratification, create plans, make decisions, and hold thoughts in mind. It also allows us to "reset” our brains' rules for how to behave. For example, we might have one set of rules for how to behave to our families and another set of rules for how to respond to strangers. The left perisylvian/language system. This system, which engages the temporal and frontal areas of the left brain hemisphere, encompasses semantic, syntactic, and phonological aspects of language. It is the foundation for our reading, pronunciation, spelling, and writing skills. The medial temporal/memory system. This system allows us to process explicit learning (text, spoken words, and pictures) and, if appropriate, store that learning. It includes our "indexing” structure (the hippocampus) and our emotional processor (the amygdala). The parietal/spatial cognition system. This system underlies our ability to mentally represent and manipulate the spatial relations among objects and primarily engages the posterior parietal cortex. This brain area is especially important for organizing, sequencing, and visualizing information. It is essential for mathematics and music and for feeling a sense of organization. The occipitotemporal/visual cognition system. This system is responsible for pattern recognition and visual mental imagery, translating mental images into more abstract representations of object shape and identity, and reciprocally translating visual memory knowledge into mental images (Gardini, Cornoldi, De Beni, & Venneri, 2008). Source: Adapted from "Neurocognitive Correlates of Socioeconomic Status in Kindergarten Children,” by K. G. Noble, M. F. Norman, and M. J. Farah, 2005, Developmental Science, 8, pp. 74–87. The value of understanding "where” in the brain vital processes occur cannot be overstated; there are significant contrasts in these key systems between the brains of lower-SES and higher-SES individuals. With the advent of cognitive neuroscience, it has become possible to assess these systems more selectively. One study (Noble, Norman, & Farah, 2005) examined the neurocognitive performance of 30 low-SES and 30 well-off African American kindergartners in the Philadelphia public schools. The children were tested on a battery of tasks adapted from the cognitive neuroscience literature, designed to assess the functioning of the aforementioned key neurocognitive systems. This was one of the first studies that showed both global and specific brain differences between lower-income and higher-income children. Another study (Farah et al., 2006) assessed middle schoolers' working memory and cognitive control and also found significant disparities between lower-income and higher-income students in the five neurocognitive areas. I'm often asked, "Has anyone actually scanned the brains of low-SES children and contrasted them with those of higher-SES children?” Yes, it has been done. And when the data are compiled and viewed by effect size, the areas of difference become dramatic (see Figure 2.6). Figure 2.6. How Do the Brains of Children from Poverty Differ? In another study (Noble, McCandliss, & Farah, 2007), 150 healthy, socioeconomically diverse 1st graders were administered tasks tapping language skills, visual-spatial skills, memory, working memory, cognitive control, and reward processing. Socioeconomic status accounted for more than 30 percent of the variance in the left perisylvian/language system and a smaller but significant portion of the variance in most other systems. One possible explanation of the strong association between socioeconomic status and language is that the perisylvian brain regions involved in language processing undergo a more protracted course of maturation in vivo (i.e., once the child is born) than any other neural region (Sowell et al., 2003). It is possible that a longer period of development leaves the language system more susceptible to environmental influences (Noble et al., 2005). For example, we have discovered that the quantity, quality, and context of parents' speech matter a great deal (Hoff, 2003). Children's vocabulary competence is influenced by the mother's socio-demographic characteristics, personal characteristics, vocabulary, and knowledge of child development (Bornstein, Haynes, & Painter, 1998). By the time most children start school, they will have been exposed to 5 million words and should know about 13,000 of them. By high school, they should know about 60,000 to 100,000 words (Huttenlocher, 1998). But that doesn't often happen in low-income homes. Weizman and Snow (2001) found that low-income caregivers speak in shorter, more grammatically simple sentences. There is less back-and-forth— fewer questions asked and fewer explanations given. As a result, children raised in poverty experience a more limited range of language capabilities. Figures 2.7 and 2.8 illustrate how parents' speech affects their children's vocabulary. Source: Adapted from "Early Vocabulary Growth: Relation to Language Input and Gender," by J. Huttenlocher, W. Haight, A. Bryk, M. Seltzer, and R. Lyons, 1991, Developmental Psychology, 27(2), pp. 236–248. Source: Adapted from Meaningful Differences in the Everyday Experiences of Young American Children, by B. Hart and T. Risley, 1995, Baltimore: Brookes Publishing. At the preschool level, inattention from care providers has a huge impact on the child's developing language skills and future IQ scores. A six-year study by Hart and Risley (1995) that followed the outcomes of children selected from different socioeconomic backgrounds found that by age 3, the children of professional parents were adding words to their vocabularies at about twice the rate of children in welfare families. Both the quantity and the quality of phrases directed at the children by caregivers correlated directly with income levels. They found that a pattern of slow vocabulary growth helped put in place a slower cognitive pattern by the time children turned 3. In fact, IQ tests performed later in childhood showed the welfare students' scores trailing behind those of the more affluent children by up to 29 percent. Parents of low socioeconomic status are also less likely to tailor their conversations to evoke thoughtful and reasoned responses from their children. Going hand in hand with language acquisition, reading is one of the most important factors affecting the development of a child's brain. Reading skills are not hardwired into the human brain; every subskill of reading, including (but not limited to) phonological awareness, fluency, vocabulary, phonics, and comprehension, must be explicitly taught. This teaching requires attention, focus, and motivation from the primary caregiver. Again, the time and expertise to make this happen are unfortunately in short supply among poor families. Evidence suggests that poverty adversely alters the trajectory of the developing reading brain (Noble, Wolmetz, Ochs, Farah, & McCandliss, 2006). Even when low-income parents do everything they can for their children, their limited resources put kids at a huge disadvantage. The growing human brain desperately needs coherent, novel, challenging input, or it will scale back its growth trajectory. When a child is neglected, the brain does not grow as much (De Bellis, 2005; Grassi-Oliveira, Ashy, & Stein, 2008). Unfortunately, low-SES children overall receive less cognitive stimulation than middle-income children do. For example, they are less likely to be read to by parents: Coley (2002) found that only 36 percent of low-income parents read to their kindergarten-age children each day, compared with 62 percent of upper-income parents. In addition, low-SES children are less likely to be coached in learning skills or helped with homework, and they are half as likely as their well-off peers to be taken to museums (Bradley, Corwyn, Burchinal et al., 2001; Bradley, Corwyn, McAdoo et al., 2001) and on other culturally enriching outings. They also have fewer play areas in their homes; have less access to computers and the Internet (and use them in less sophisticated ways); own fewer books, toys, and other recreational or learning materials; spend more time watching television; and are less likely to have friends over to play (Evans, 2004). Low-income parents' financial limitations often exclude their kids from healthy after-school activities, such as music, athletics, dance, or drama (Bracey, 2006). Many children raised in poverty enter school a step behind their well-off peers. The cognitive stimulation parents provide in the early childhood years is crucial, and as we have seen, poor children receive less of it than their well-off peers do. These deficits have been linked to underdeveloped cognitive, social, and emotional competence in later childhood and have been shown to be increasingly important influences on vocabulary growth, IQ, and social skills (Bradley, Corwyn, Burchinal et al., 2001; Bradley, Corwyn, McAdoo et al., 2001). Standardized intelligence tests show a correlation between poverty and lower cognitive achievement, and low-SES kids often earn below-average scores in reading, math, and science and demonstrate poor writing skills. Although the effects of poverty are not automatic or fixed, they often set in motion a vicious and stubborn cycle of low expectations. Poor academic performance often leads to diminished expectations, which spread across the board and undermine children's overall self-esteem. The dramatic socioeconomic divide in education doesn't help matters. High-poverty, high-minority schools receive significantly less state and local money than do more prosperous schools, and students in such schools are more likely to be taught by teachers who are inexperienced or teaching outside their specialties (Jerald, 2001) (see Figure 2.9). This gap is most evident in the subjects of math and reading. Source: Adapted from Dispelling the Myth Revisited: Preliminary Findings from a Nationwide Analysis of "High-Flying” Schools, by C. D. Jerald, 2001, Washington, DC: The Education Trust. Constantino (2005) examined six communities in the greater Los Angeles, California, area and found that children in high-income communities had access to significantly more books than children in low-income communities did. In fact, she found that in some affluent communities, children had more books in their homes than low-SES children had in all school sources combined. Milne and Plourde (2006) identified six 2nd graders who came from low-income households but demonstrated high achievement and found that these children's parents provided educational materials, implemented and engaged in structured reading and study time, limited television viewing, and emphasized the importance of education. The researchers concluded that many of the factors of low socioeconomic status that negatively affect student academic success could be overcome by better educating parents about these essential needs. The composite of academic skills needed for school success is actually a short list. I have introduced these skills as chunks scattered throughout this chapter. In Chapter 3, I list them together as an aggregate of subskills I call the fundamental "operating system” for academic success. Perseverance and ability to apply skills in the long term. Identify and define the problem. Evaluate each solution with a checklist or rubric. Follow up and debrief on the results to learn. A vision or a hearing problem. A phonemic awareness or phonics issue. Quality assessment is essential, but follow-through is even more important. Pinpointed assessments are crucial to determine areas of strength and weakness. For example, the Woodcock-Johnson III Diagnostic Reading Battery can reveal specific areas that need targeted practice. Provide hope and support. Any student who feels "less than” cognitively is likely not only to struggle academically, but also to be susceptible to such secondary issues as acting out, getting bullied or becoming a bully, having lower self-esteem, or having feelings of depression or helplessness. Ensure that teachers build supportive relationships, provide positive guidance, foster hope and optimism, and take time for affirmation and celebration. Although the cognitive deficits in children from low-income families can seem daunting, the strategies available today are far more targeted and effective than ever before. Kids from all over the United States can succeed with the right interventions. I discuss these further in Chapters 4 and 5. Recruit and train the best staff you can. You cannot afford to let disadvantaged kids receive substandard teaching. A Boston Public Schools (1998) study of the effects of teachers found that in one academic year, the top third of teachers produced as much as six times the learning growth as the bottom third of teachers did. Tenth graders taught by the least effective teachers made almost no gains in reading and even lost ground in math. To find superior teachers, start asking around the district and at conferences, post ads for teachers who love kids and love challenges, and ask the existing good teachers at your school, "How do we keep you here?” Recruiting great teachers is never easy, but it is possible if you know how to appeal to them. Top teachers crave challenge and workplace flexibility and look for highly supportive administrators. They continually strive to upgrade their skills and knowledge by participating in staff development, attending out-of-town conferences, and seeking out printed materials or DVDs. Appeal to their values and specify what you can offer. As we have seen, low-SES children are often subject to such health and safety issues as malnutrition, environmental hazards, and insufficient health care. Health and achievement overlap: every cell in our body needs a healthy environment to function optimally. When a body's cells are besieged daily by stressors, they slow their growth trajectory and contract. Kids raised in poverty have more cells in their body "under siege” than do kids from middle- or upper-income families. The consequent adaptations that these kids' immune systems make diminish their ability to concentrate, learn, and behave appropriately. Stanford neuroscientist and stress expert Robert Sapolsky (2005) found that the lower a child's socioeconomic status is, the lower his or her overall health. Substandard housing in low-income neighborhoods leaves children exposed to everything from greater pedestrian risks (heavier traffic on narrower streets) to environmental hazards (exposure to radon and carbon monoxide) (Evans, 2004). Poor housing quality may cause respiratory morbidity and childhood injuries (Matte & Jacobs, 2000) and may elevate psychological distress in children (Evans, Wells, & Moch, 2003). Poor children are more likely to live in old and inadequately maintained housing and to be exposed to lead in peeling paint (Sargent et al., 1995)—a factor associated with decreased IQ (Schwartz, 1994). And, as with other risk factors, these negative environmental effects synergize with and build on one another (Evans & Kantrowitz, 2002). The lower parents' income is, the more likely it is that children will be born premature, low in birth weight, or with disabilities (Bradley & Corwyn, 2002). Expectant mothers living in poverty are more likely to live or work in hazardous environments; to be exposed to pesticides (Moses et al., 1993); and to smoke, drink alcohol, or use drugs during pregnancy, all factors linked to prenatal issues and birth defects (Bradley & Corwyn, 2002) and adverse cognitive outcomes in children (Chasnoff et al., 1998). Children from low-income families have generally poorer physical health than do their more affluent peers. In particular, there is a higher incidence of such conditions as asthma (Gottlieb, Beiser, & O'Connor, 1995), respiratory infections (Simoes, 2003), tuberculosis (Rogers & Ginzberg, 1993), ear infections and hearing loss (Menyuk, 1980), and obesity (Wang & Zhang, 2006). Contributing factors include poor nutrition (Bridgman & Phillips, 1998), unhealthy environmental conditions, and inability to obtain appropriate health care. Children with no health insurance may receive little or no treatment for illnesses and are far more likely to die from injuries or infections than are well-off children (Bradley & Corwyn, 2002). In addition, early health conditions may have significant long-term consequences, even if children's socioeconomic status improves later in life (McLoyd, 1998). Further, Broadman (2004) found that a significant portion of health differentials across neighborhoods (high- and low-income) could be explained by the disparate levels of stress across these neighborhoods. Incidents of illness during class. Rates of undiagnosed and/or untreated health problems or disabilities. Each of these issues can occur among middle- and upper-income students, but they are both more common and more severe among students living in poverty. As a result, low-SES kids are often missing key classroom content and skills. Teachers may see students as uncaring or uninterested, when the real issue is that they're not in class enough to keep up. Providing a physician on-site once a week. Working with a local pharmacy to arrange for access to medications. Arranging for a dentist to make designated school visits. Educating students' caregivers about school resources. Providing tutors to help students who miss classes to catch up. Improving awareness among staff about health-related issues. There are serious limitations on what schools can and should do about student health. But all of us understand that when we don't feel right, it's hard to listen, concentrate, and learn. Successful schools find ways to ensure that students have a fighting chance to get and stay healthy. Provides wraparound health and medical services. Minimizes negative stress and strengthens coping skills. Uses a cognitively challenging curriculum. Provides tutoring and pullout services to build student skills. Fosters close relationships with staff and peers. Offers plenty of exercise options. The whole point of school ought to be to enrich the life of every student. Enrichment does not mean "more” or "faster” schooling. It means rich, balanced, sustained, positive, and contrasting learning environments. That's what will change students' lives over the long haul (see Figure 2.10). Source: Adapted from "The Development of Cognitive and Academic Abilities: Growth Curves from an Early Childhood Educational Experiment," by F. A. Campbell, E. P. Pungello, S. Miller-Johnson, M. Burchinal, and C. T. Ramey, 2001, Developmental Psychology, 37(2), pp. 231–242. 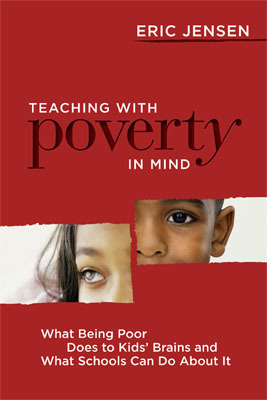 This chapter has painted a bleak picture of children raised in poverty. Certainly not all children raised in poverty experience the brain and behavioral changes described in this chapter, but we have seen that an aggregation of disadvantages creates a difficult web of negatives. Poverty penetrates deeper into the body, brain, and soul than many of us realize. A childhood spent in poverty often sets the stage for a lifetime of setbacks. Secure attachments and stable environments, so vitally important to the social and emotional development of young children, are often denied to our neediest kids. These children experience more stress due to loneliness, aggression, isolation, and deviance in their peer relationships, and they are more likely to describe feeling deprived, embarrassed, picked on, or bullied. As a result, they more often face future struggles in marital and other relationships. However, research (Hill, Bromell, Tyson, & Flint, 2007) suggests that although the first five years of a child's life are very important, there is tremendous opportunity during the school years for significant transformation. Low-SES children's behavior is an adaptive response to a chronic condition of poverty, but a brain that is susceptible to adverse environmental effects is equally susceptible to positive, enriching effects. You'll learn more about how brains can change for the better in Chapter 3. Copyright © 2009 by ASCD. All rights reserved. No part of this publication—including the drawings, graphs, illustrations, or chapters, except for brief quotations in critical reviews or articles—may be reproduced or transmitted in any form or by any means, electronic or mechanical, including photocopy, recording, or any information storage and retrieval system, without permission from ASCD.